A lot of environments want to use Time Machine at scale. But prior to Lion there hasn’t been a simple way to do so. Apple has introduced a new weapon in the war to backup client computers in the new command tmutil that was introduced in OS X Lion. The tmutil command allows administrators to enable Time Machine, make snapshots, kick off backups, delete snapshots, perform restores, configure options within Time Machine and, with a little scripting, build a centralized dashboard, pulling in Time Machine statistics from clients. The first thing to know is that pretty much everything you do in Time Machine is going to require elevated privileges. So if you are writing a script, it should run as such, or if you’re running each command independently you will likely need to prefix them with sudo. Let’s start with a computer that doesn’t have Time Machine enabled. To enable it, use tmutil along with the enable verb: tmutil enable To disable Time Machine, use the disable verb: tmutil disable This is the equivalent of sliding the Time Machine slider between the ON and OFF positions. We’ll also enable local backups, turning on snapshots: tmutil enablelocal But these don’t yet associate Time Machine with any disks or configure any of the settings. 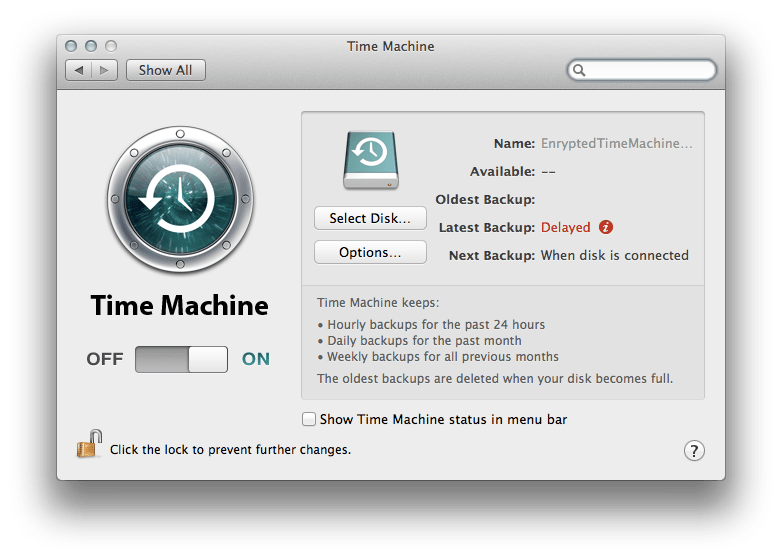 One of the first things people usually do when they enable Time Machine is to configure a destination volume for backups as you cannot backup if you don’t have a place to backup to. This is done using the setdestination verb. The destination can be a local file system or a network mounted share. To set a destination as a local volume, simply follow the setdestination verb with an argument that indicates the path to use. For example, if you are pointing backups to a volume called remade: tmutil setdestination /Volumes/reamde Setting a destination will either write data into a DestinationVolumeUUIDs key in /Library/Preferences/com.apple.TimeMachine.plist. The contents of the key match the Volume UUID output of diskutil info. For example: diskutil info disk1s2 | grep Volume UUID Therefore, it is possible to swap UUIDs using a script on a biweekly or weekly basis or using tmutil along with the volume name, to match an offsite rotation rather than changing the volume in the System Preference pane. In the case of a network mounted share, you would still use the setdestination verb, but define that the target location is a network mount by embedding a URL into the command rather than a file system path. The traditional URL will consist of protocol followed by :// followed by the hostname/sharename. We can go an extra step and also embed the username and password delimited by a colon and prefixing the hostname, using an @ to separate the credentials and the hostname. For example, if we wanted to define a hostname of tm.krypted.com with a share of snowcrash and a username of neal with a password of theU to access that share we would use the following: tmutil setdestination afp://neal:theU@tm.krypted.com/snowcrash Given that you might not want the password embedded into the command, you can use -p to enter a password manually (the password will not be displayed in the terminal screen). In this case, leave the username embedded into the path as follows: tmutil setdestination -p afp://neal@tm.krypted.com/snowcrash While the inclusion of a computer name in the path of actual Time Machine backups seems to indicate that it is OK to allow multiple computers to use it, doing so seems discouraged in Apple’s Time Machine documentation. Therefore, sticking with one computer per share will likely be the most secure and least corruptible means of backup. While creating a bunch of shares for backups might seem daunting at first, it’s worth mention that you can script share creation, per client computer in OS X Server using the sharing command. For example, to create a share for a computer named neal in /Shared with AFP only and no guest access: sharing -a /Shared/neal -s 100 -g 000 To list computers in Open Directory: dscl /LDAPv3/127.0.0.1 -list Computers Variabalizing the dscl output into an array and creating machine-specific shares would then net a share per computer (assuming all computers have corresponding records in the directory service). Likewise, shares can be built using a DeployStudio, Absolute Manage or Casper machine export as well. The Time Machine System Preference pane doesn’t give you a lot of features for managing retention and recycling media. But with OS X Lion, you can now manage and delete given snapshots of data, thus allowing for manually cleaning out your backups (or doing so with a script that has a lot more logic than the default settings). To see a list of snapshots, use the listbackups verb: tmutil listbackups You will see output of each snapshot on the computer: /Volumes/EncryptedTMBackup/Backups.backupdb/stephenson.krypted.com/2011-08-09-181840 /Volumes/EncryptedTMBackup/Backups.backupdb/stephenson.krypted.com/2011-08-09-195105 To just see that last snapshot: tmutil latestbackup The fitting delete verb is used for such a task and is able to take the argument of an old snapshot (or an array of such) to delete. For example, to delete snapshot 2011-08-09 -181840 for computer stephenson.krypted.com on /Volumes/EncryptedTMBackup tmutil delete /Volumes/EncryptedTMBackup/Backups.backupdb/stephenson.krypted.com/2011-08-09-181840 You can also calculate how much drift has occurred between snapshots: tmutil calculatedrift /Volumes/EncryptedTMBackup/Backups.backupdb/stephenson.krypted.com/2011-08-09-195105 The calculatedrift verb will show the amount of data added, removed and changed between each backup as well as output the averages of drift between backups (helpful in capacity planning and reporting). To compare a snapshot to a file system path (or paths), use the compare verb. This is handy for figuring out which snapshots you might be able to nuke if you’re scripting a delete process. The compare verb is one of the more complicated as there are a number of options for how to compare data. tmutil compare /Volumes/EncryptedTMBackup/Backups.backupdb/stephenson.krypted.com/2011-08-09-195105 The output can be a bit verbose as it looks at each directory. You can limit the depth using a -D option. You can also specify a number of different options to specify what differences to look for when performing lookups. The output of compare is helpful if you preflight your backups with a sanity check to verify there is enough room (otherwise the user might get a Time Machine error dialog). The tmutil command also has options for troubleshooting, moving disks and restores. The restore verb can be handy as you can send restore scripts to clients over ARD or even build a self-restore portal with more options than can be found in the TIme Machine restore screen (I’d recommend using the -v option with restores, btw). The inheritbackup verb can be used to take ownership of a machine directory, useful when moving disks or shares between clients. The associatedisk verb can be used to attach a disk to a backup, thus allowing you to skip beginning backups all over again if the UUID of a disk changes. Also, the options in 10.6 are still applicable. To suppress the dialog to make all new disks a TimeMachine volume: defaults write com.apple.TimeMachine DoNotOfferNewDisksForBackup -bool YES Backups are also still kicked off by com.apple.backupd-auto.plist, stored in /System/Library/LaunchDaemons and the interval between backups can be changed using the StartInterval key here. For example, if you set it to 360 then backups will occur every 6 minutes instead of 60, or more likely, if you set the integer to 14400 then your backups will occur every 4 hours instead of every hour. In OS X Lion, Apple has released a tool called Lion Recovery, that lets you repair disks or reinstall OS X Lion without the need for a physical disc. But a lot of administrators and other users have had concerns over how to build a custom recovery disk so they can have physical media handy to perform such restores. Today, Apple has released Lion Recovery Disk Assistant, which allows administrators to build such physical media. Lion Recovery Disk Assistant will install a recovery partition on a USB-attached volume (you can always clone from USB later if you really want it to be a SCSI or Fibre Channel volume). This partition doesn’t mount by default when booted into a functional Lion client and is invisible except when booting holding down the option key. Many of us have been creating recovery disks manually with Disk Utility. However, Apple performs a little magic with their Recovery Disks and they boot way faster than the rigged volumes we’ve been creating. Anywho – get it here.